For enthusiasts of Italian Medieval art, the Basilica of San Francesco in Assisi is incomparable. The attribution of the frescoes may provoke endless debate, but I would say never mind who painted them - just look, and wonder! Saint Francis died in October 1226. His extraordinary reputation was already established, and he was proclaimed saint in 1228. This meant pilgrims, and it was clear that an appropriate setting for his relics would be required. The Spiritual Franciscans thought that something simple to reflect Francis's life and beliefs would be appropriate, but this was swept aside. The story of the planning and construction of the Basilica at a very difficult period in the history of the Italian peninsula is complex, and well described elsewhere. What to me is most interesting is the message about Francis presented to the pilgrims - he was much more than just another saint - he was the second Christ, Franciscus alter Christus. It is sometimes suggested that this notion stems from the writing of Bonaventura (1221 - 1274), in particular his Legenda Major (Life of St Francis) of 1263. Central to this idea was the stigmatisation of Francis as the fulfilment of his life, paralleling Christ's crucifixion. Bonaventura, though, hadn't come up with the idea; it was based on an existing tradition, already expressed in Vita Beati Francisci, the Life of St Francis by Thomas of Celano, commissioned by Pope Gregory IX in 1228 and completed the following year, while the basilica was under construction. Around 1244 - 47 Thomas wrote a longer life of Francis, focusing on the the more miraculous and spiritual aspects, and I will be consulting both when looking at the early frescoes in the nave. After Francis's death the search began for the ideal site for his burial. Just outside the walls of Assisi was a small hill, used up to that point for the execution of criminals and known as the Colle dell'Inferno. The resonances provoked by this contemporary Golgotha was not lost on the Franciscan movement, and work began here in 1228. The body of Francis was moved to the site in 1230. The frescoes in the Basilica are much earlier, of course, before this painting tradition supposedly began. However, the identification with Christ is already evident. 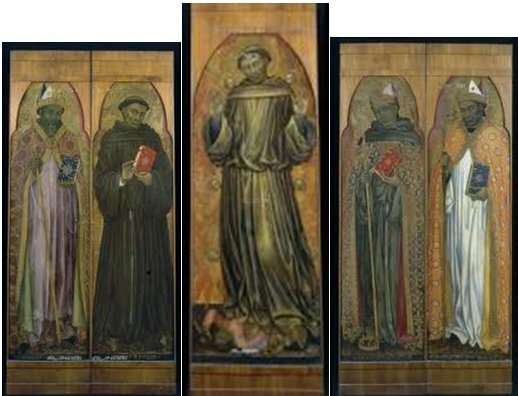 This is mainly done by presenting parallel sequences of the life of Christ, particularly the Passion, and the life of Francis. By the time pilgrims reached the presbytery in the lower church the message became much more explicit. (Or more obscure, depending on how well those pilgrims had tackled their theology homework.) I will explore this later. As Anne Derbes discusses, in Picturing the Passion in Late Medieval Italy, devotion to the Passion was central to Franciscan ideology. Regular church visitors will be struck by the unusual orientation of the Basilica - main entrance to the east, altar and apse to the west., known as 'occidental orientation'. Why is this? The main reason would appear to be practical, but there may be a little more to it than this. Practically, the entrance for pilgrims would need to face the town, which is to the east. In addition, the area reserved for the friars - the presbytery - worked much better in the west, as that was where the convento sacro was situated, due to the lie of the land. Any other way would have involved rather complex manoeuvres to get friars and pilgrims to the correct place. There were other examples of this layout in Italy, most notably the original orientation of the Basilica of St Peter's in Rome, and the Lateran Basilica. Perhaps even more significantly, it was the orientation of the Church of the Holy Sepulchre in Jerusalem. It was thus considered an appropriate orientation for churches containing the burial places of saints, and echoes still further the life and death of Christ. May 2015: a return to Assisi for an extended visit to the town and the Basilica, enabling me to revise the photographs and add additional material. September 2015: I have now posted on the Upper Church; link below.